Back: Thomas Payne, Louise Payne (née Rowland), Michael Rowland, Paul Rowland, Mark Powell, Tona Powell. 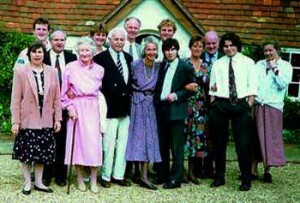 Front: Angie and Tim Rowland, Joan and Paul Rowland, Veronica Powell (née Rowland), John Rowland, Mary Rowland, Edward Rowland. After Alexander William died in 1869, the remaining partners in the family business, namely his son Henry Edward, his brother John Henry and his son John Alexander executed a document on 27th May 1870. In this the retirement of John Alexander was recorded (no doubt he found the cost of the 2 guineas a day for non attendance very demanding; in fact he was probably working in his father’s East India Merchant business) He was replaced by his younger brother George William. Their father John Henry died in 1871, leaving the business in the hands of his son George William and Henry Edward (son of Alexander William) This document also records annuities of £2,940 (now £190,000) to Charles Bentley Bingley and John Edwards Bennett. Perhaps they were worthy retainers in the business, and ran it whilst Alexander William was travelling around Europe or enjoying himself in Brighton and John Henry was running his East India business. Certainly the payments anticipate those to Sir Fred Goodwin in generosity. John Henry’s estate had a probate value of £35,000 (about £2.25 m now) Under his will he left an annuity of £500 (to be financed by rents from Chambers in the City) and a life interest in Belmont, South Norwood Hill to his second wife Jane. The rest was shared between his three surviving sons; Rev. Frank Oakley-£5,000 and half the Macassar Oil business buyout payments, and the residue of the City Chambers; John Alexander- his East India business, with his wife and children getting half the Macassar Oil buy out; George William-the residue of Belmont and the Macassar Oil business (in partnership with his cousin, Henry Edward). It is possible that Henry Edward sold part of his interest in the business to George William, so he could devote himself to his study of the Doomsday Book, on which he was a great expert. He was then living at Arrandale, Lawrie Avenue, Lewisham, a fine avenue of mansions and then at Tresillion, South Norwood. He died in 1882. His estate had a probate value of about £7,500. He left his wife a life interest of £2,000 p.a. in the Macassar Oil buy out and the balance to his five children. None of them joined the business, so by 1882 George William was the sole proprietor. 1861- Alexander William; John Henry. 1866- Alexander William; John Henry, Henry Edward, John Alexander. 1870- John Henry, Henry Edward, George William. 1871- Henry Edward; George William. Hilda Rowland’s jewellery bequest to St Stephen’s, Gloucester Road. George William spent a number of his early years with his in-laws. Chesterfield Gayford was a wine merchant living at 17 Brunswick Terrace, Brighton, next door to Alexander William’s house. George William married his daughter Marion. They are all recorded, with their daughter Hilda in the 1881 and 1891 censuses as living there in some style, with his two sons, four house servants, a butler and a footman. Interestingly this house features in “England’s thousand best houses”. It has been acquired by a society with plans to preserve it as an historic building. Maybe George William commuted each day from Brighton to 20 Hatton Garden. But by 1901 perhaps he found living with his in laws arduous; in the census he is recorded as living at 50 Queens Gardens, Paddington with his wife, daughter and one servant. Alternatively he may always have had a place in Paddington-his daughter is recorded as born there, and used the Brighton house as a holiday home, like Alexander William. Later he moved to 13 Vicarage Gate, Kensington, and then to 11 Rosary Gardens, South Kensington where he lived until he died in 1925. He left the business, after a life interest to his wife, to his unmarried daughter Hilda May Gayford Rowland . She sold it to Beechams in the 1940’s allegedly for £30,000 (now £1.5m) According to Stella Layton it’s sole assets then were a typewriter, a teaspoon and two cups! Hilda was living at 221 Cromwell Road, South Kensington at the time of her death in 1946, round the corner from my parents’ flat in Lexham Gardens. My father knew about her as the Macassar Oil beneficiary and had intended to visit her and introduce himself as a distant relation, but he did not get there in time. Her estate was £38,169-1s-11d, most of which went to a friend Rita Christina Marian de Santi. She also left £1,800 to the Battersea Dogs Home and the Hospital for Sick Animals, and £250 to her great nephew and godson Paul Frank Rowland (see below) She also left her diamond jewellery to St Stephen’s, Gloucester Road, to be set in the chalice and other vessels used by the church. George William’s brother Frank Oakley went to Worcester College, Oxford like Rev William John, and also took Holy Orders, on 23rd September, 1872. In the 1891 census he is living at 5 Listers Avenue, Finsbury Park with his wife Annie Antonia Titley Naters Walker and their children Annie and Wilfred and 6 servants (priests clearly needed much assistance with temporal matters in those days) In the 1901 census Rev. Frank Oakley was at Westbrook House, Ambrose Place, Worthing with his aunt Matilta Laport, and Wilfred and three servants. Rev. Frank Oakley died in 1907, and the same year Wilfred, known in the family as Bunt, married Rose Collet. They continued living in Sussex; he tried various businesses including a coach business called the Silver Queen. But he is said to have devoted more of his time to the Dun House Inn in Findon. He died in 1958 leaving about £10,000 each to his children Paul and Stella. Paul, born in 1908 was at one stage considered for the Macassar Oil business, but that was not to be. Instead he joined the Gas, Light and Coke Company until it was nationalised. Later he grew mushrooms at Langford, Clymping, and his son Tim, who became an osteopath and chiropodist, now lives there. Tim’s older brother Mike also worked in the mushroom business and lives nearby. Their sister Veronica, who teaches music after studying at the Royal Academy, lives in Surrey. It was Dudley who initiated contact with “my side” of the family after 3 generations separation. In fact if my father had visited Hilda, he might have made contact with his third cousin Paul a few years earlier. My father and Stella did much of the work putting the family tree together.